Mmm…steamed dumplings. They are a great change of pace from everyday fare and cook quickly, but we must admit, they are a labor of love. Once you have the dumpling-stuffing technique down pat, the recipe is much less challenging. Let’s get started! Chop ½ cup cabbage (regular old cabbage works just as well as the fancier varieties) and put it in a bowl with some salt. Let it sit while you chop up 3 or 4 scallions in small pieces. Once the scallions are ready, take a paper towel and squeeze excess liquid out of the cabbage. To the bowl of cabbage, add the scallions, about 1/3 pound of ground pork (ground beef also works) and a couple of teaspoons of soy sauce. Now you have a wonton filling mixture that will make about 40 wontons. It will keep in the refrigerator a couple of days, so you can enjoy it for a couple of meals. As for filling the wontons: get wonton wrappers from the grocery store. They’re usually found in the refrigerated or frozen sections. Square or round wonton wrappers are more cooperative than rectangular ones. Remove from the package the number of wonton wrappers that you’ll need for the meal and separate them so that it’s easy to pick up each one individually. Keep the rest of the wrappers in the fridge. Take out two plates, and brush one with some oil so that when you’re ready to steam, they are easily removed from the plate. Fill a small dish with some water in which you can wet your fingertips. Place a wonton wrapper on the second plate, and brush along the edges with your wet fingertips. Then place a ball of wonton filling – about the diameter of a quarter – into the center of the wrapper. Gently pull one corner of the wrapper across to its opposite corner so that you now have a triangle-shaped pocket. Seal the edges with your fingertips. Take the two opposite corners and bring them toward the center, pressing them together. Bring the third point to the center, and press that into the other two corners. Now you have your wonton pocket. Repeat the process until your wontons are all filled. Or, for a quicker and simpler way, gather all corners up to form a pyramid and squeeze to make a little purse. Now it’s time to steam, and the good news is that it’s fast, especially if you have a rice cooker with a steamer basket. Get your rice cooking while you’re wrapping the wontons, and then remove the rice and keep it warm sandwiched between two plates. Next, if you have a steamer basket on the rice cooker, fill the rice pot with about an inch of water, heat it on the cooker and put on the steamer attachment and lid. You can do the same with a pot on the stove and a steamer basket insert. Steam the dumplings in a single layer on the basket for about 4 ½ minutes. 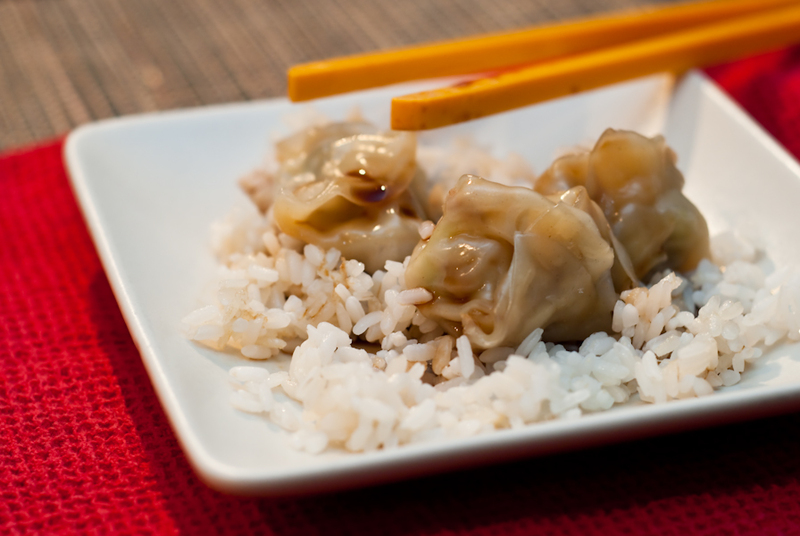 Steaming is a healthy way to enjoy dumplings, and using low-sodium soy sauce is another healthy move. Do you make wontons at home? Did you try this recipe? Let us know what you think! How Stacey Got the Shot: In the kitchen with the Nifty Fifty, flash bounced off the ceiling, ISO 800, f/3.2 in 1/50 second. And yes, the food got a little cold.